Arctic warming exposes soil carbon to increased degradation, increasing CO2 and CH4 emissions. 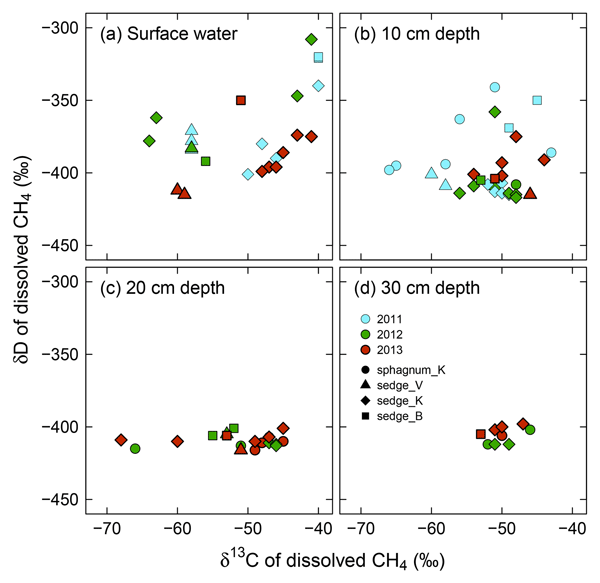 Models underrepresent anaerobic decomposition that predominates wet soils. We simulated microbial growth, pH regulation, and anaerobic carbon decomposition in a new model, parameterized and validated with prior soil incubation data. 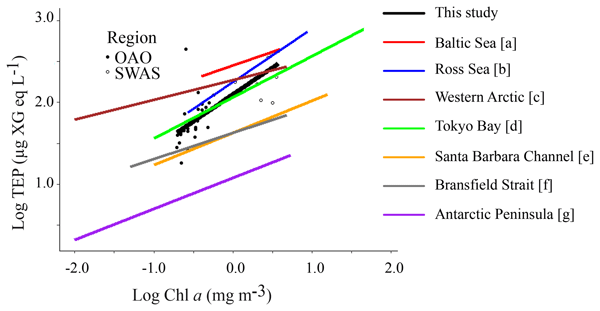 The model accurately simulated CO2 production and strong influences of water content, pH, methanogen biomass, and competing electron acceptors on CH4 production. We provide a first determination of k in human-impacted subtropical streams and small rivers. High and highly variable k values reflect different controls on water turbulence. New models of k are developed using water depth and flow velocity. 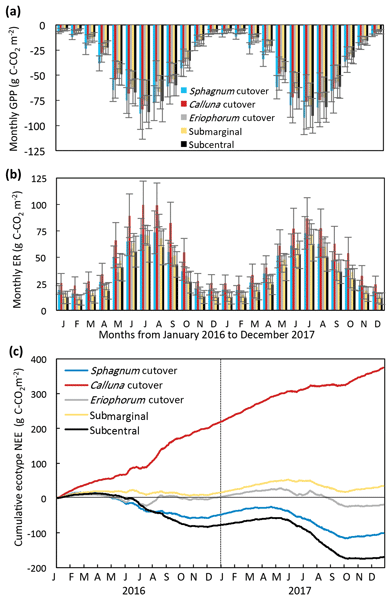 We show that previous estimates of riverine CO2 evasion from subtropical streams and small rivers are conservative and highlight the importance of incorporating scale-appropriate k measurements into extensive pCO2 investigations for accurate C budgets. 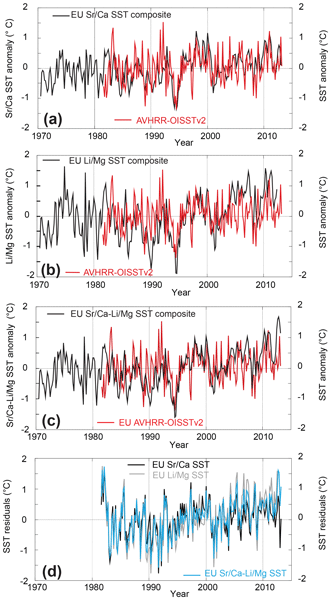 Here we report seasonally resolved sea surface temperature (SST) reconstructions for the southern Mozambique Channel in the SW Indian Ocean, a region located along the thermohaline ocean surface circulation route, based on multi-trace-element temperature proxy records preserved in two Porites sp. coral cores for the past 42 years. Particularly, we show the suitability of both separate and combined Sr / Ca and Li / Mg proxies for improved multielement SST reconstructions. Abbeyleix Bog in the Irish Midlands contains areas that were historically harvested for peat and then abandoned as well as areas that were never harvested. This study measured the carbon balance for both harvested locations and unharvested locations at Abbeyleix Bog. Measurements were conducted in the field over 2 years. This was carried out to understand how the historic harvesting and later abandonment of peat affect greenhouse gas emissions. 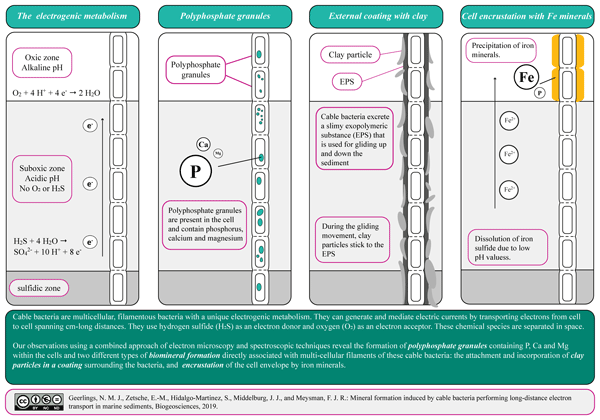 Many marine microorganisms produce polysaccharide-rich transparent exopolymer particles (TEPs) for rather unknown reasons but with important consequences for the ocean carbon cycle, sea–air gas exchange and formation of organic aerosols. Here we compare surface–ocean distributions of TEPs and physical, chemical and biological variables along a N–S transect in the Atlantic Ocean. Our data suggest that phytoplankton and not bacteria are the main TEP producers, and solar radiation acts as a sink. 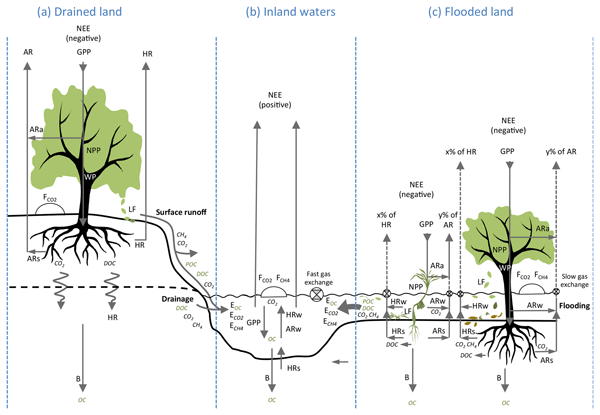 Based on classical concepts in ecology, and a literature survey, we highlight the importance of flooded land as a preferential source of atmospheric carbon to aquatic systems at the global scale. 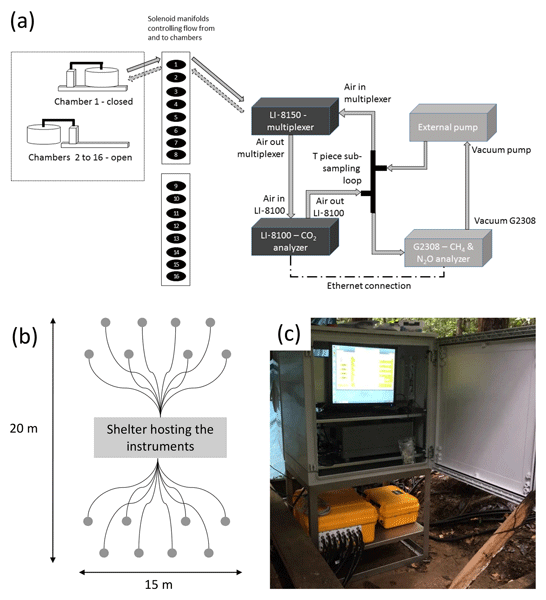 Studies in terrestrial and aquatic ecosystems could be reconciled by considering the occurrence of an efficient wetland CO2 pump to river systems. New methodological approaches coupling hydrology and ecology are also necessary to improve scientific knowledge on carbon fluxes at the land–water interface. 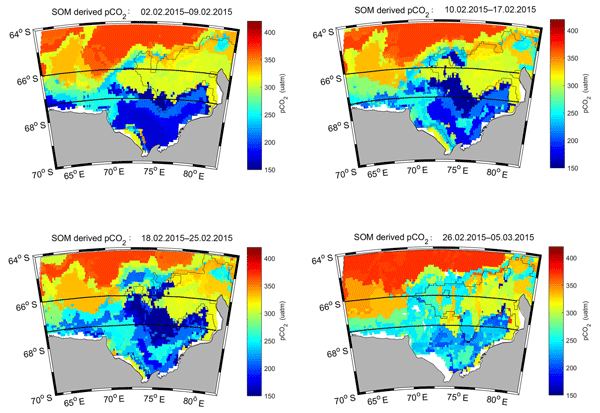 In this study we applied the self-organizing map (SOM) method to estimate the oceanic pCO2 in Prydz Bay derived from its main controlling factors. The RMSE of the SOM-derived pCO2 was 22.14 µatm compared to SOCAT datasets. Our results showed that the monthly averaged uptake of atmospheric CO2 for February 2015 was 23.57±6.36 TgC. 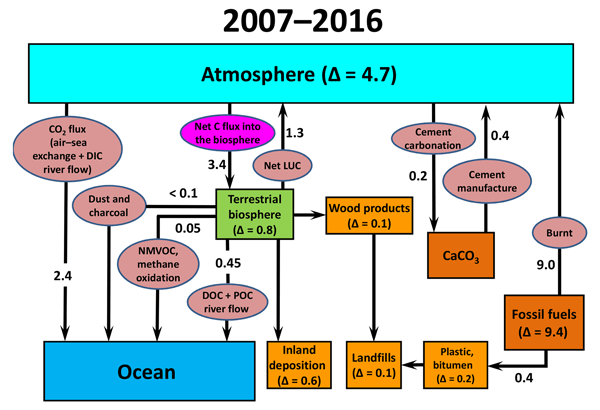 Strong potential anthropogenic CO2 uptake in the shelf region will enhance ocean acidification (OA) in the deep water of Prydz Bay and subsequently affect deep OA.